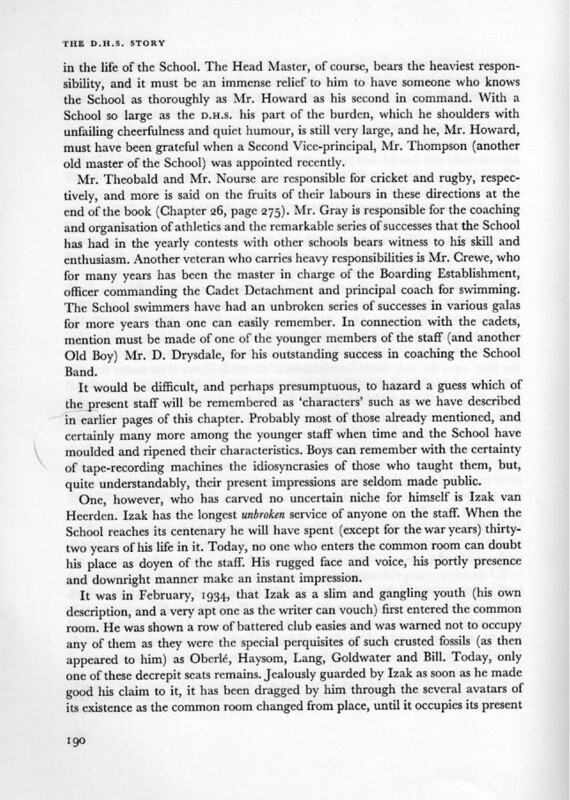 Here are some historical memoirs about aspects of the school by Andrew Cowan, head prefect in 1965; classmate Chris Harris; Headmaster A.W. 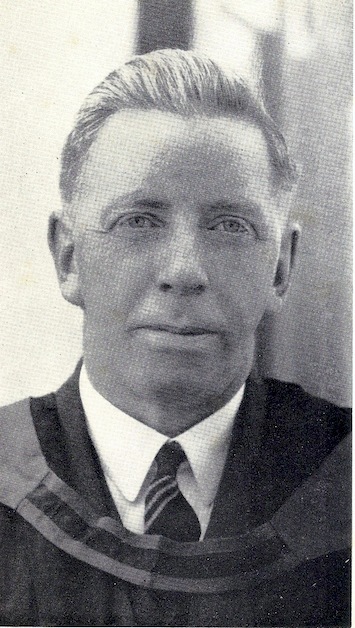 McIver; Hubert Jennings, a teacher in the early sixties; David Brokensha, a pupil in the thirties; and the poet Roy Campbell, who entered DHS in 1910. 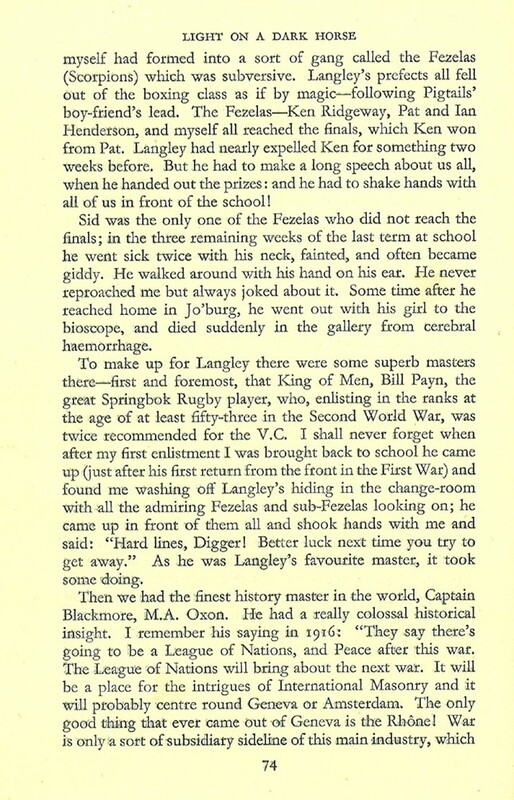 Reading these histories gives a sense of the forces that shaped the school in our time, and of the abiding influence of the famous (or infamous) headmaster A.S. Langley. 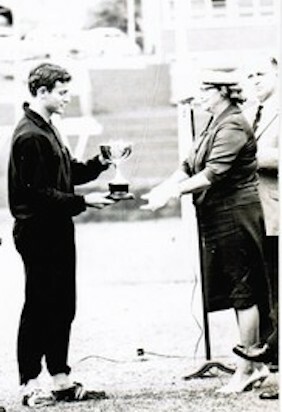 Andrew Cowan, as star athlete at DHS, 1965. There was no greater honour at DHS than to be selected as Head Prefect. But in 1965 the Head Prefect, Andrew Cowan, resigned his position rather than fulfill his obligation to cane boys for minor infractions of the school rules, particularly the dress code. At that time, caning offenses included: having a jacket unbuttoned, having a loose tie, having a straw basher at any angle other than parallel to the ground, having a handkerchief, pen, or other object showing in a pocket, having a hand resting in a pocket, wearing trousers with a cuff of less than 22 inches circumference, and appearing in public at any time, including weekends and school holidays, in anything other than full school uniform. 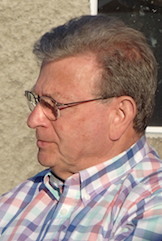 Cowan's resignation started a debate about practices that had previously been unquestioned, and though it took several more years, led to the abolition of canings of some boys by others. After nearly 50 years the events surrounding my resignation as Head Boy in 1965 are understandably vague. If anyone wishes to question or correct my account of events please feel free to do so. I certainly will not be offended. I have very fond memories of my time at DHS. Although I was not academic (had to stay down a year so actually matriculated in 1965) my achievements on the sports field clearly allowed me to shine in a school where sport played a particularly important role. Given my sporting achievements it came as no real surprise, when, at the end of year 9, I was amongst a group of boys appointed as temporary prefects to cover those on study leave for their matriculation examinations. This was usually a good indication that you were in the frame for being selected as a full prefect the following year. What did come as a complete surprise however, was when, on the very first day of the new term, while congregating outside the school hall waiting to go into the first assembly, I was summoned to the Headmasters office to be informed that I had been appointed Head Boy. The shock of the appointment was such that I did not give much thought to the issues that were to cause me such angst in the weeks to come. I therefore accepted the position with much pride and in full knowledge that this would included the authority to cane. I do not recall having had particularly strong views against caning itself. Caning had been a long established tradition and I had been at the receiving end on more than one occasion. What did bother me however were the strict rules relating to wearing of the school uniform and the liberal use of the cane in circumstances that I believed were trivial and inappropriate. Whilst I sympathised with those who felt it an imposition to have to wear the uniform on non-school occasions I personally was always very proud to wear it. I considered the navy and gold to be a cut above the rest and the gold braid of the honours blazer particularly classy! I have great difficulty recalling the actual rules that were in force or the exact procedures that would lead to a caning. As I recall, anyone caught (I think the term used was 'claimed') infringing a rule was brought to the prefect’s room during break and depending on the nature of the ‘crime’, would receive punishment ranging from detention and lines to caning. It became increasingly uncomfortable for me having to administer punishment under such circumstances. 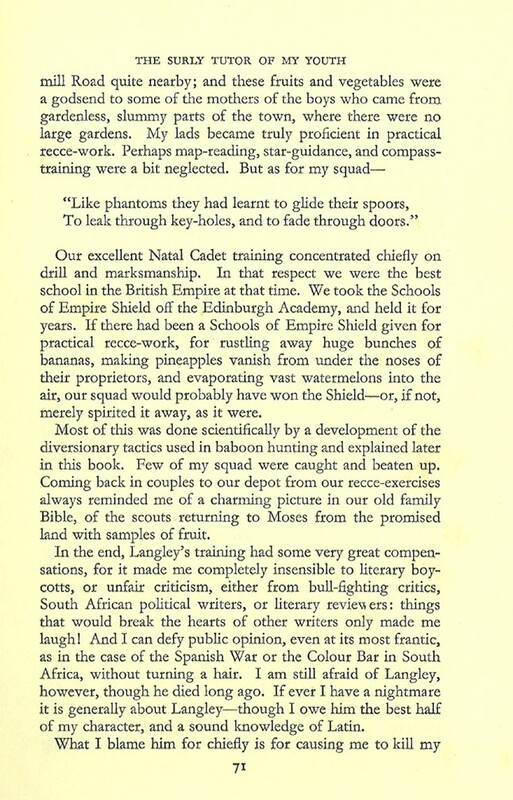 Indeed, there were occasions when I was expected to use the cane but because I did not think it appropriate and so as not to undermine the authority of my co-prefects, I would take the ‘victim’ into the prefects study, issue a verbal caution, whack a cricket bag a couple of times and suggest they leave the study rubbing their backsides!! Cleary that situation could not continue and there followed several meetings with McIver during which I attempted to persuade him to relax some of the uniform rules. I have to say that he was always respectful of my views but the Victorian values of that generation simply did not allow him to countenance any such change and once we had reached an impasse, I was asked to consider my position. As you might well imagine my appointment as Head Boy had been a great source of pride to my parents and they tried desperately to dissuade me from resigning. However my position had become untenable and after a great deal of anguish I finally handed in my resignation. I do remember it being a very painful period and for quite some time questioned whether giving up such a huge and rare honour had been worth it. Following my resignation I have to say that I was never criticised or ostracised. Indeed, I was overwhelmed with messages of support and good wishes and the incident was even reported in the local press. Although I returned to the ‘ranks’ I was allowed to continue as OC of Cadets, a role normally reserved for the Head Boy. Those close to me believe that this incident was true to form – too sensitive, too principled and too stubborn! - and they are probably right. If I am honest with myself perhaps it displayed a weakness rather than a strength in my character. If I had my time again would I make the same decision? Probably yes. May I take this opportunity to thank all who have said such kind and flattering words over the years about what was clearly in its own small way a significant moment in the history of what I believe was and hopefully will continue to be a great school. Our classmate Chris Harris, 2014. Our teacher Bill Payn, giving career guidance to Mel Glover of the class of 1963. 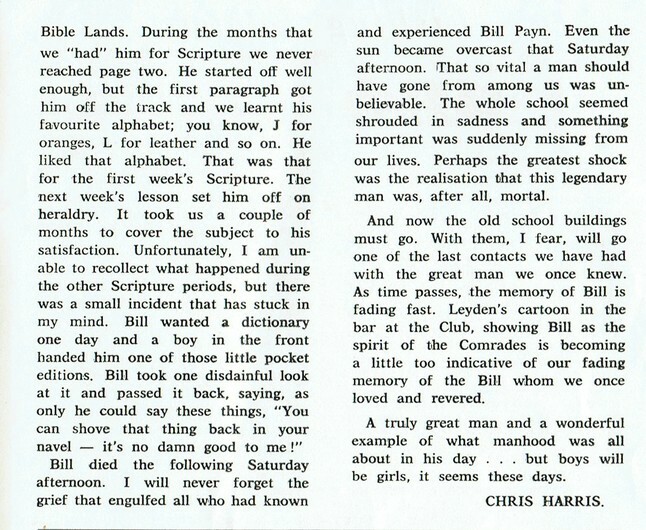 Chris Harris, who was in the class of 1961 and who later did teacher training at DHS, wrote this article about Bill Payn, the teacher who was a living legend even before we arrived at the school. 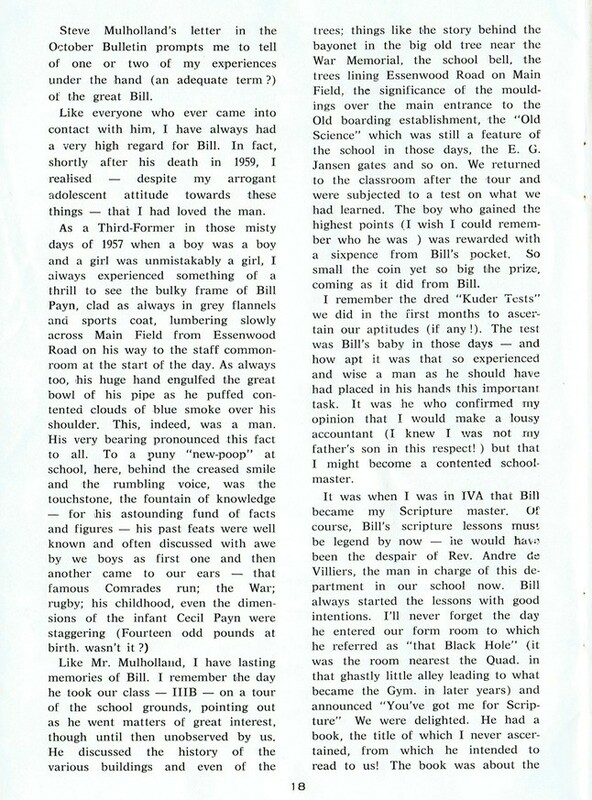 The article appeared in the DHS Old Boys Bulletin in January 1971. 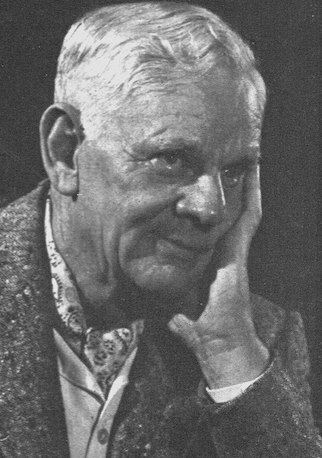 Hubert Jennings was born in England in 1896. 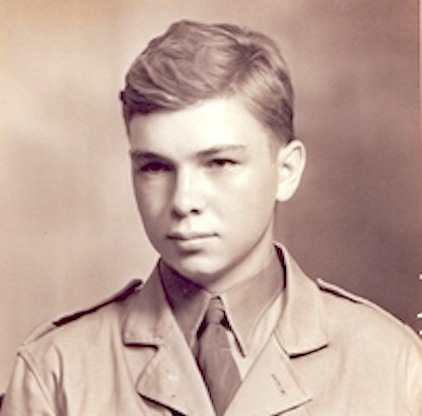 At the age of 18 he went to fight in World War I, and survived four years of trench warfare in France and Flanders. He subsequently completed university studies in London and Wales. 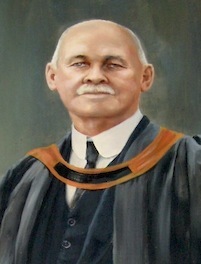 Jennings emigrated to South Africa in 1923, where he took up an appointment at DHS which lasted until 1935. 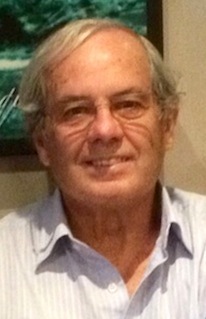 He then served as headmaster at three other Natal High Schools. He retired in 1956 but was called back to the school in 1960 to help with the shortage of teachers caused by the postwar "baby boom". 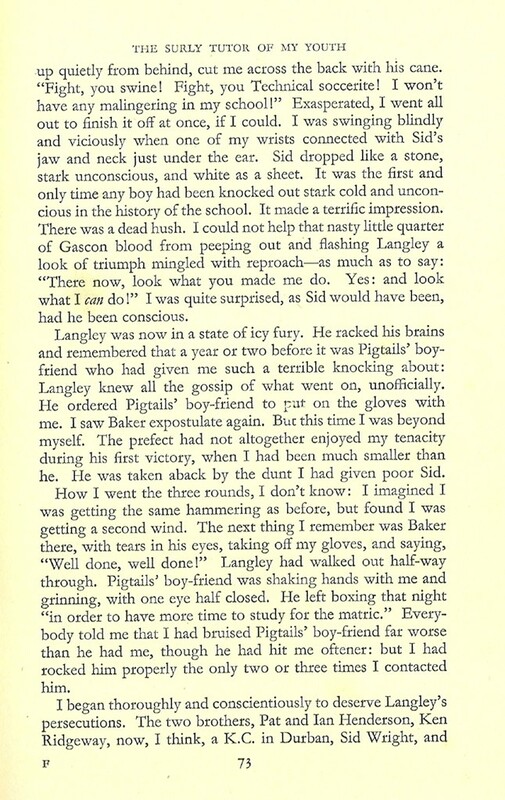 Jennings had one glass eye and was known to schoolboys as "Polyphemus", after the one-eyed giant in classical mythology. 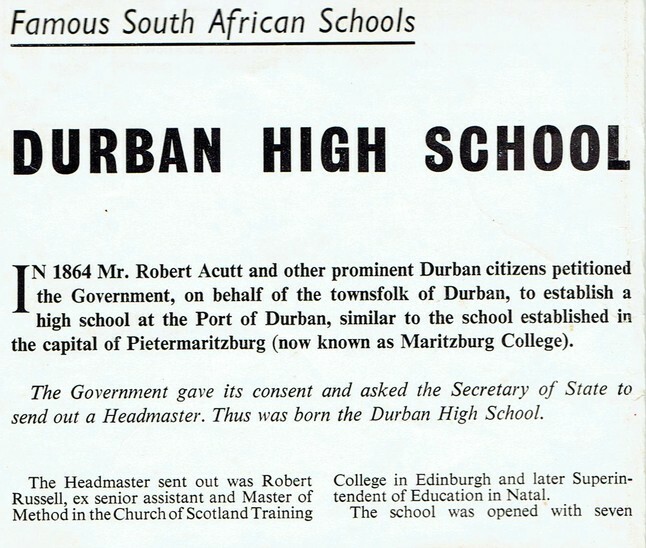 During his second stint at DHS he wrote a history of the school to mark its 100th anniversary in 1966. The book, The DHS Story 1866-1966, was published by the DHS Memorial Trust in that year. 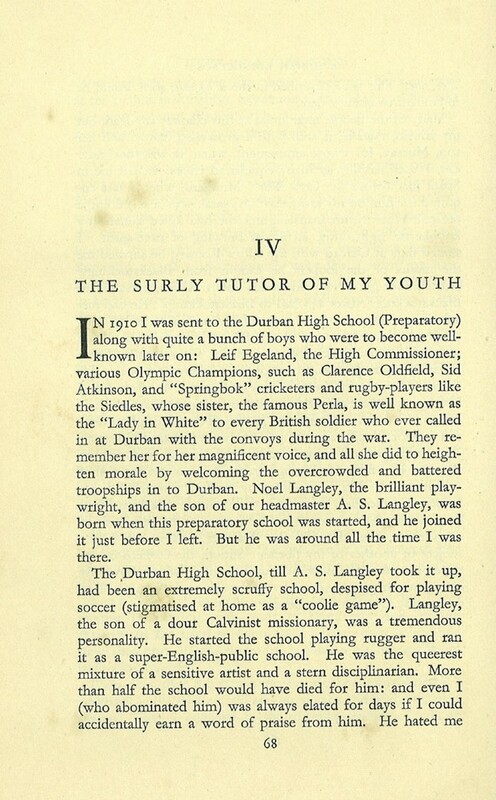 Much of the book is concerned with the early history of the school and the exploits of DHS boys in wartime, but in one of the chapters Jennings wrote about several of our own teachers. That material is reproduced below. 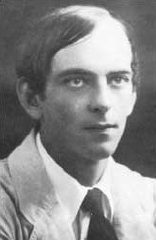 David Brokenshaw as a young man. 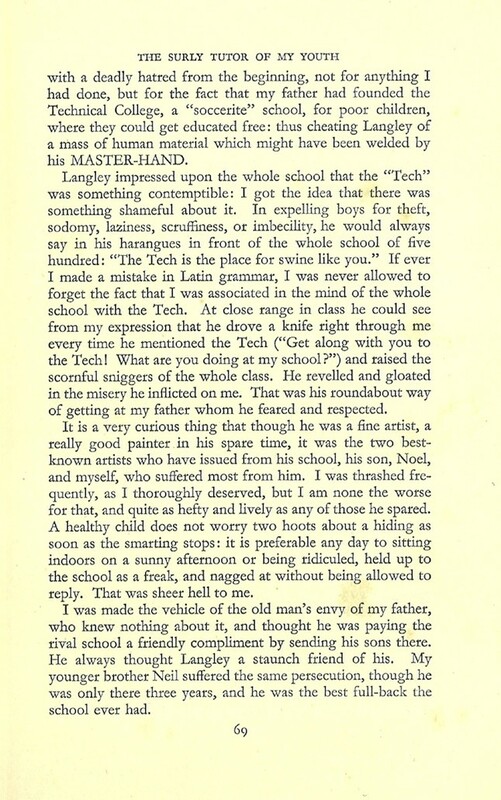 Many memoirs, especially if written by boys who attended boarding schools, contain an almost obligatory account of hated and miserable schooldays, often featuring sadistic teachers and bullying boys. I was fortunate in that I loved school right from the start. I had no experience of being a boarder, and I remember few unhappy times. I do not recall any help with homework: we expected to do that on our own, seeking advice, if needed, from our school pals, not from our parents. There were no Parent–Teacher Associations, and schoolteachers discouraged too close an interest by parents in the day-to-day operations of the school. 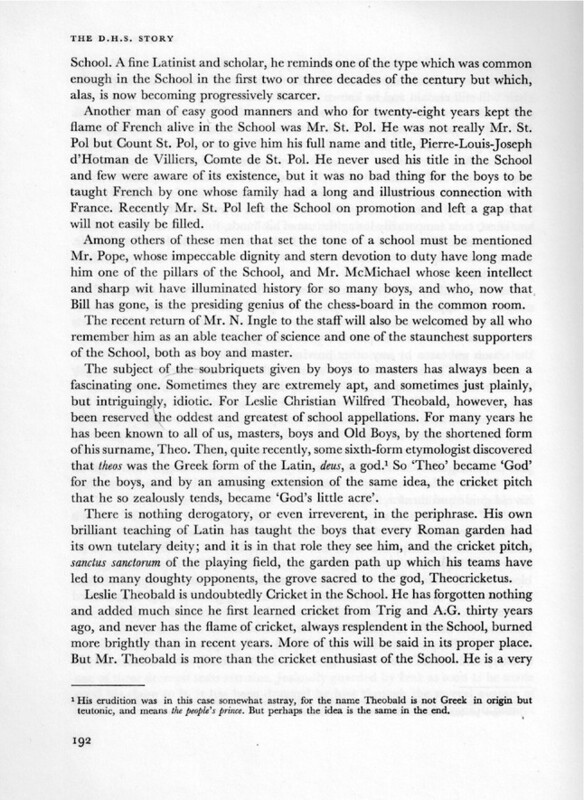 Parents were encouraged to come only on formal occasions, such as to rugby or cricket matches against rival schools, or to plays. During my five years at Durban High School, I doubt whether my parents came to the school more than once or twice a year. I remember Miss Bull, a formidable new teacher, storming into our classroom, announcing, ‘I’m bull by name and bull by nature, so don’t give me any trouble.’ Some time later, one of the bolder – or more imaginative – boys told us that he had gone to the staffroom and, finding no teacher present, had looked inside Miss Bull’s handbag, ‘and do you know what I saw? … there was a revolver and a French letter.’ This dramatic announcement stuck in my memory, representing the acme of wickedness – even though I had to ask Paul what a ‘French letter’ was, and his explanation left me puzzled. 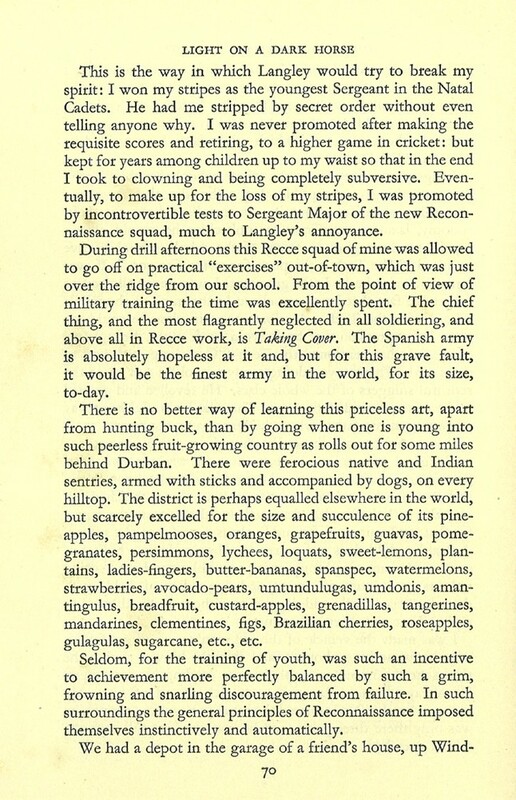 As for the school Cadet Corps, I loathed the whole exercise and managed to get myself excused – I do not remember on what grounds. Instead of the pointless marching up and down, I helped two disabled boys hand out rifles and uniforms. The form masters were angry at having their lessons interrupted, but everyone accepted Mr Langley’s obsession. What a wonderful way of playing soldiers! 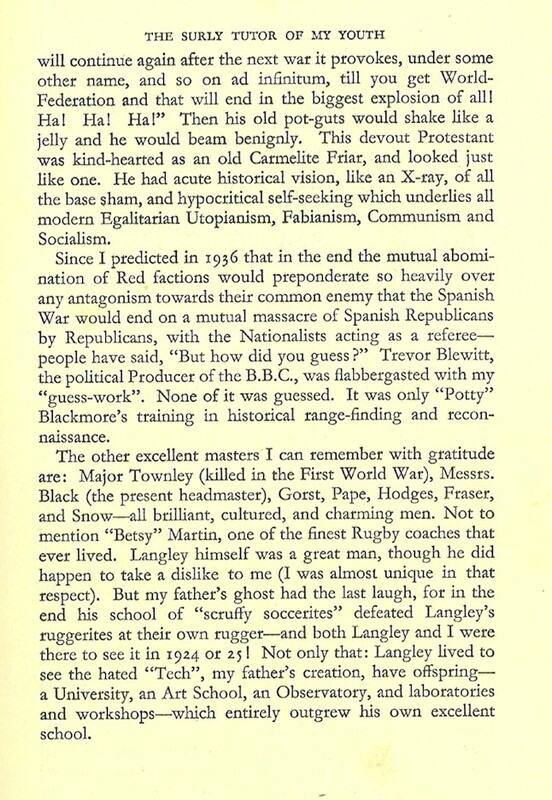 Surely this was better than being obsessed, as other headmasters were, with ‘immorality’. 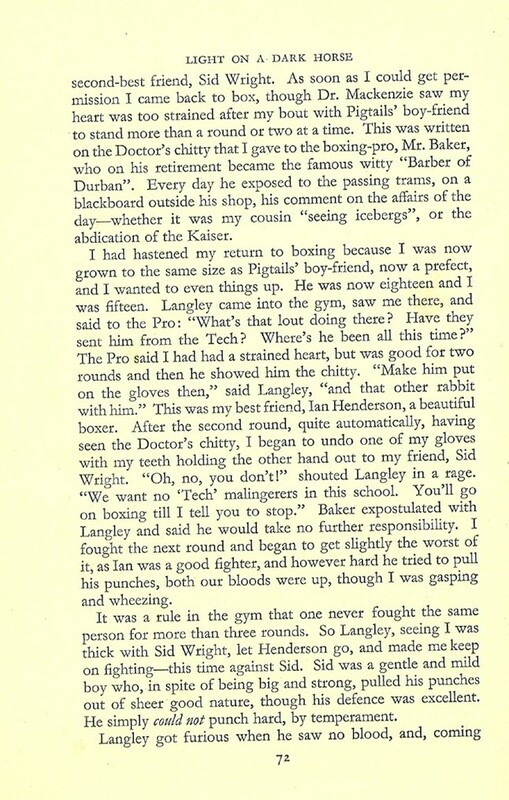 Guy told me that as a result of these unscheduled exercises he had a good understanding of why the Duke of Wellington had said that he nearly lost the Battle of Waterloo. Although they brought history vividly alive, such unorthodox methods – involving the whole school – would probably be frowned on today. I was caned twice during my time at DHS, the first occasion being on my very first day at school. Proudly wearing my new boater (the school straw hat, commonly referred to as a ‘basher’), I walked under an arch, and was promptly told by one of the school prefects to follow him. 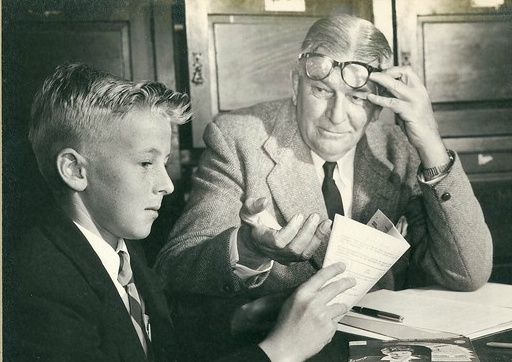 I knew this senior boy – everyone knew Skonk Nicholson (head boy, captain of both cricket and rugby) – and I wondered why he should deign to notice me. Taking me into the ‘boot room’, where several other prefects lounged about, he told me to bend over, and, with no explanation, he caned me. It was not very painful: I remember feeling above all puzzled as to what my offence was. As I left the room, one of the prefects said, ‘Next time, you will pay respect and remove your basher.’ Later I learned that the arch was a memorial to DHS boys who had been killed in World War 1. Lesson learnt. One morning a few years later, Alastair Dark and I were cycling along Currie Road on our way to school, and blithely rode across Sydenham Road, as we did each morning. But we had ignored a newly-installed STOP sign, and were called over by a police officer who must have been lying in wait. He said that it was no good charging us, so instead he would report us to our headmaster, who would mete out our punishment. Mr Black felt obliged to give us a lecture on road safety, followed by a perfunctory caning. Neither caning did me any harm, in fact, for a usually obedient boy, the canings increased my school ‘cred’. Mr Langley’s successor, Mr Black, also had an obsession, but of a much more mundane sort: he could not abide boys smoking cigarettes. On one memorable occasion the entire cricket First XI was discovered smoking. At assembly the following morning the whole school was present (including the Jewish boys, normally excused from prayers) while the disgraced cricket team stood nervously on the platform with the headmaster and staff. After giving a short lecture on the evils of smoking, ‘which will not be tolerated in my school’, Mr Black proceeded to cane each of the cricketers, who had to bend over in turn to receive ‘six of the best’. Mr Black was so angry that he lost count, giving one boy only five strokes. This was followed by a shout from the floor: ‘You missed one, sir.’ We all burst out laughing. Mr Black sailed, not very skilfully, on Durban Bay. We encountered him one Saturday, when Paul and I were in Jimmy Whittle’s twenty-two foot scow. Paul persuaded Jimmy to let him take over the helm and executed a deft manoeuvre, going sharply about, right in front of Mr Black’s craft, and showering him with a sheet of water. ‘Oh, sorry, sir,’ shouted a joyful Paul, while Mr Black glowered at one of his most unruly and impudent pupils. 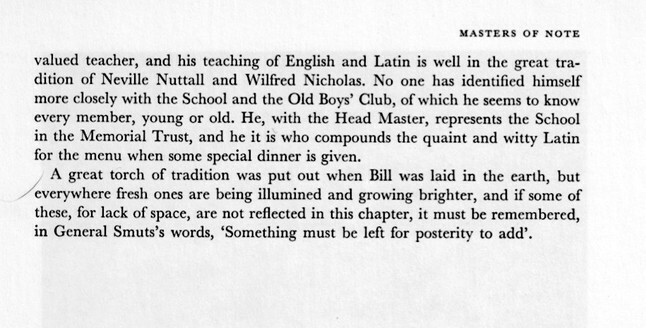 I am grateful to most of my schoolmasters, particularly to Neville Nuttall, who taught us English, which he loved. He enlarged my horizons, leading me to an appreciation of English literature. 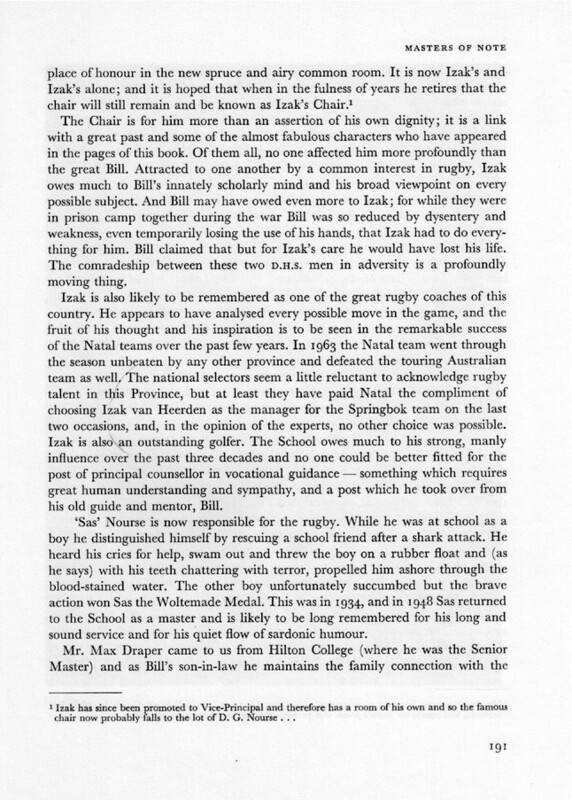 I was assistant editor of the school magazine, and also secretary of the Debating Society, both of these positions supervised by Mr Nuttall. The main purpose of the Debating Society was to introduce outside speakers, and I was given a free hand in inviting these guests. Once, when I was stuck for a speaker, I enlisted my father’s cousin, Leslie Brokensha, who used to write as The Wayfarer in the Natal Daily News. On another occasion I invited my Auntie Lil’s husband, Sidney Brisker, then a senator for the governing United Party. Both Leslie and Sidney were flamboyant characters, and both did me proud, as did Jock Leyden, cartoonist on the Natal Mercury, who delighted us with his rapid sketches and insightful comments. My involvement in these activities marked the beginning of my awareness of the grave political, social and environmental problems facing South Africa, and of the huge inequalities in its society. 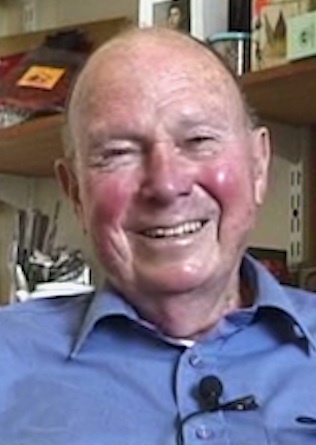 In these extramural activities Neville Nuttall was always there, unobtrusively encouraging and guiding me. On one occasion I arranged for the Sixth Form to visit the Durban abattoir, where we witnessed the ‘Judas goat’ leading the hapless sheep up to the slaughter house. I was most proud of having also organised a tour, by train, of about twenty of my school mates, to Johannesburg, Pretoria and Kimberley. The South African Railways staff were most accommodating – once they had recovered from their shock at dealing with a young boy. On this tour, members of the Old Boys Association kindly took us into their homes, and arranged for us to visit places of interest. It was my first visit to the Transvaal and to the Northern Cape. In the junior forms, history lessons concentrated on South Africa, with emphasis on dramatic episodes such as the Great Trek of the 1830s, when many Afrikaner families left the Cape Colony to settle in the interior, partly in protest against the emancipation of slaves. The history syllabus inevitably focused on the whites, with the few Africans who were mentioned being shadowy figures – obedient servants, or violent enemies. Mr Evans, our history master, had firm ideas about teaching: for example, when we were studying the French Revolution we learnt the Seven Causes, the Seven Courses and the Seven Effects – hardly any of which can I recall today. Mr Evans was demanding, requiring the upper forms to write an essay every week. When I arrived home on Friday afternoons, Ouma would urge me to write the essay and get it out of the way, but often I was distracted by friends, and then on Saturday and Sunday I would spend all day on the bay, or at the beach, and would be too tired in the evening to tackle the essay. The result was that I would get up on Monday morning at 4 a.m. and write desperately. Later in my life I have had occasion to resort to this tactic, finding that the early hours are my most productive.